St John’s Chambers in Bristol will be hosting an invited seminar on 12th June to launch Dr. Ryan-Morgan’s book 'Mental Capacity Casebook: Clinical Assessment & Legal Commentary'(Routledge). The book is due for publication in April / May 2019. We are delighted to welcome Dr. David Abankwa to Neuro Rehab Wales. Talis Consulting Ltd. will soon be moving to premises that better meet the needs of the practice. Their current office building is for sale: Please click here for more information. Dr. Ryan-Morgan has been invited by the Chair of the Division of Neuropsychology to be on their newly established Awards Panel, co-chaired by Professors Gus Baker and Barbara Wilson. As of October 2013 Dr. Tracey Ryan-Morgan is the Clinical Lead and Consultant Clinical Neuropsychologist for the BIRT Assessment and Rehabilitation Unit in Llanelli (part-time) whilst still maintaining private practice at Talis Consulting Limited. Tracey’s new role involves providing strategic professional and clinical leadership to BIRT within the 24 bed specialist residential neurobehavioural rehabilitation centre at Llanelli (opening in March 2014) and across the South Wales region, providing expert clinical consultation and professional guidance to clinical neuropsychologists, clinical psychologists and other clinicians within BIRT. 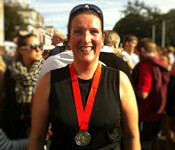 On 6th October, Tracey completed the Cardiff Half - Marathon in the top third of runners. Her finishing time of 2 hours 30 minutes also places her 152nd out of all female runners in her age group. Tracey is currently in discussion with Springer publishers about a book proposal she has drawn up on the subject of Mental Capacity. Watch this space...! Dr. Ryan-Morgan has published 'Assessment of Mental Capacity' as a joint book chapter in Practical Neuropsychological Rehabilitation in Acquired Brain Injury: A guide for Working Clinicians. The Addenbrooke's Cognitive Examination (ACE) is one of the most popular and commonly-used screening tools for dementia and the mobile version brings additional advantages to the clinician, with supported administration and scoring as well as automated reporting and supported audit.